Welcome to the July edition of “It’s All Set” a monthly tablescape series brought to you by a group of my decor blogging buddies. 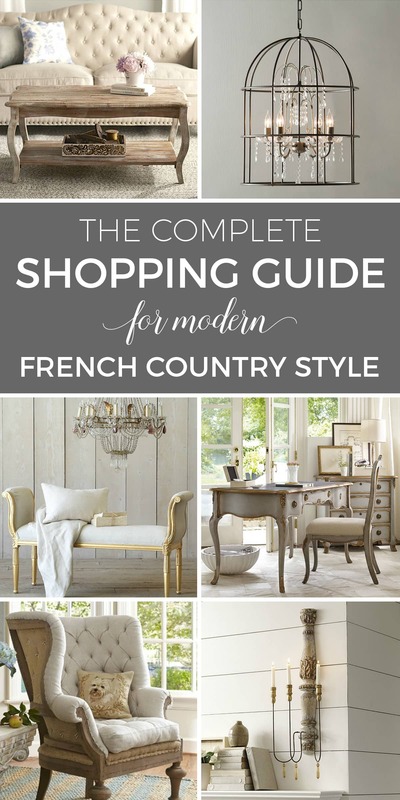 Be sure to visit the other tables linked at the bottom of this post. 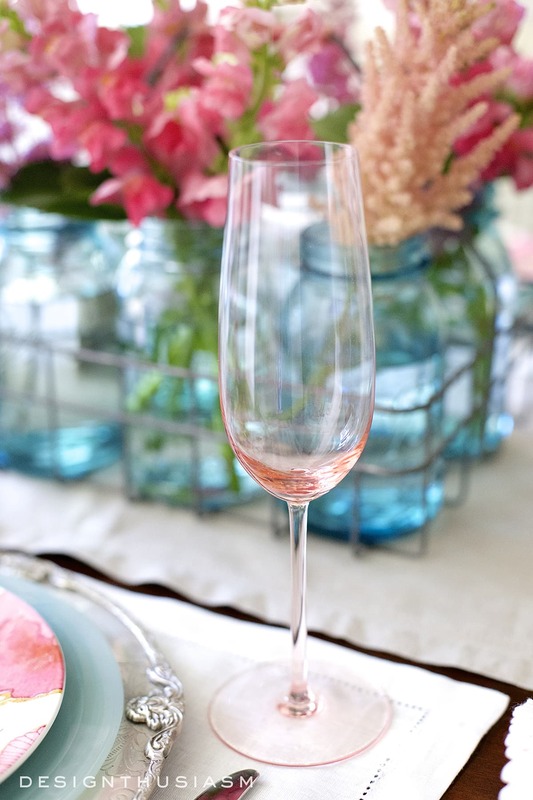 For my setting this month, I gave some thought to what I like to see on the table once the summer is in full force and the thematic occasions like graduation and July 4th are well past. 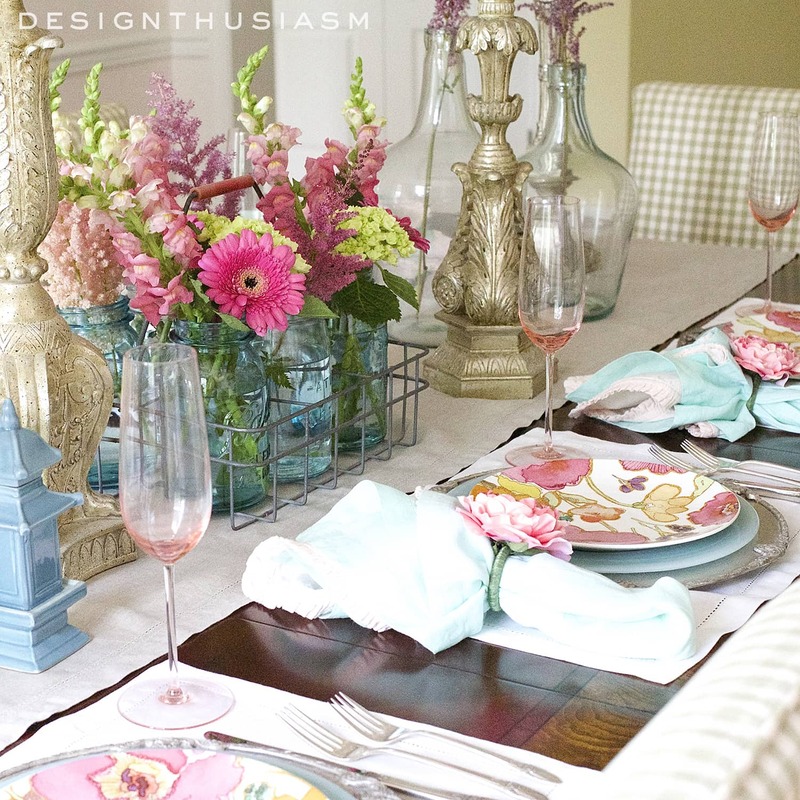 What makes me smile for an evening of seasonal entertaining is summer flowers in a colorful tablescape. As with most of my tables, this one began with a patterned plate, in this case a cheerful floral in pinks and other sunbaked brights. This drove the color feeling of the entire presentation, and I chose to pull out the blue tones to pair with the pinks. You can see the mixed palette throughout the tableau, with varied shades working together yet reading as primarily aqua and pink. 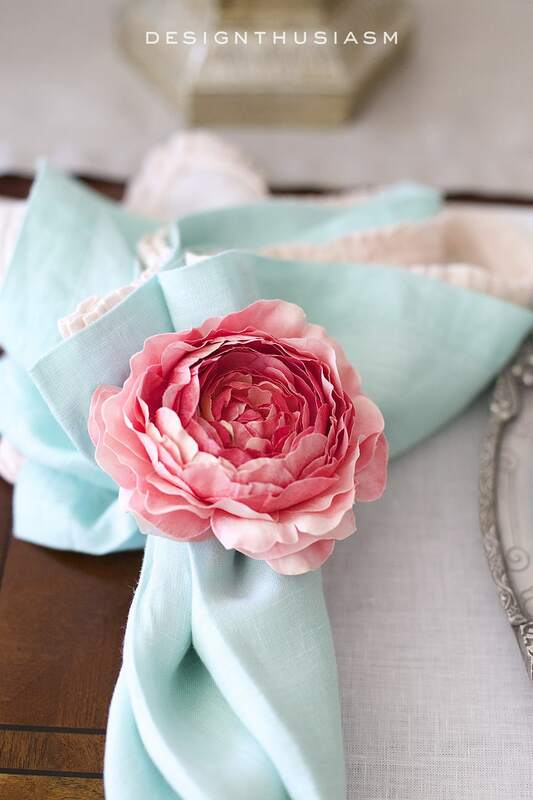 For the napkin cluster I layered a pale blush pink with ruffled edging beneath a soft aqua linen, all gathered together within these fabulous peony napkin rings. 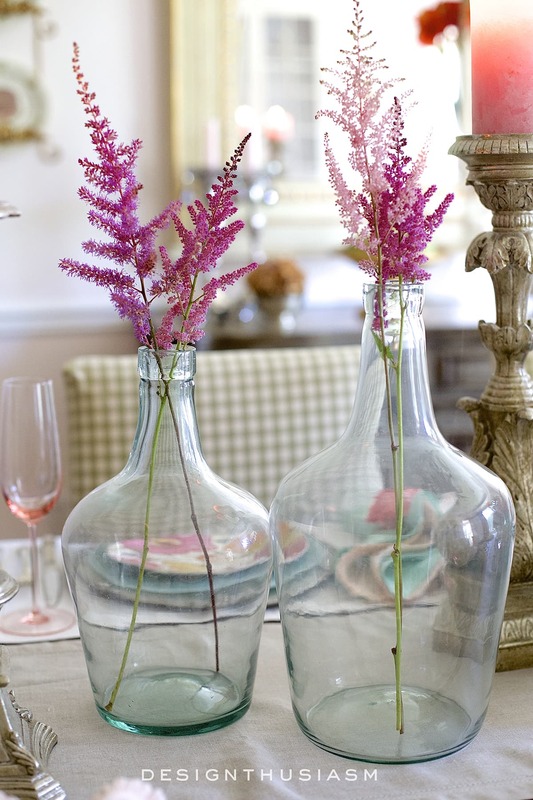 To add some sculptural interest I added a few reproduction demijohns with sprigs of astilbe tucked inside. 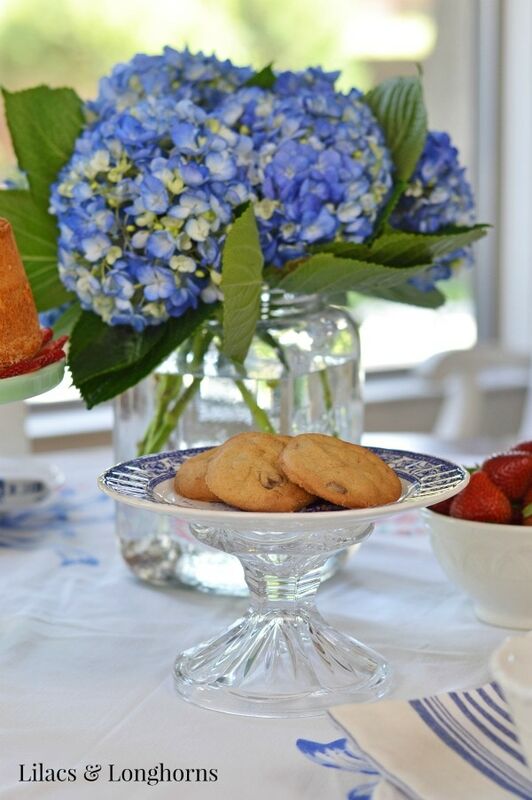 The centerpiece is served in a grouping of blue vintage mason jars with a summery mix that includes gerber daisies and mini hydrangea. For height I added silvery candlesticks with acanthus leaf designs. 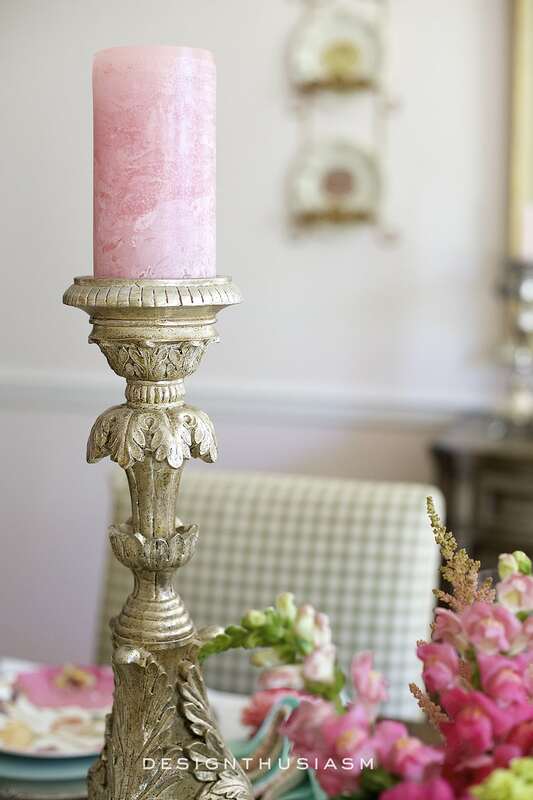 They’re topped with pink pillars for added warmth and rosy color. Grounding the tablescape amidst this burst of summer color is a simple khaki runner and white linen placemats. For stemware I went with blush pink flutes, again to pick up the rose tones. I love the way they play off the watery hued mason jars. Backing the floral salad plates are my recently purchased aqua alabaster dinner plates and elegant silver chargers. And just for a touch of fun I added these wonderful cerulean pagodas from my friend Tina of The Enchanted Home. I’m joining with several bloggers to bring you this monthly tablescape series. LOVE the color combination. Every detail is so gorgeous. Well done! Oh my goodness, Lory! 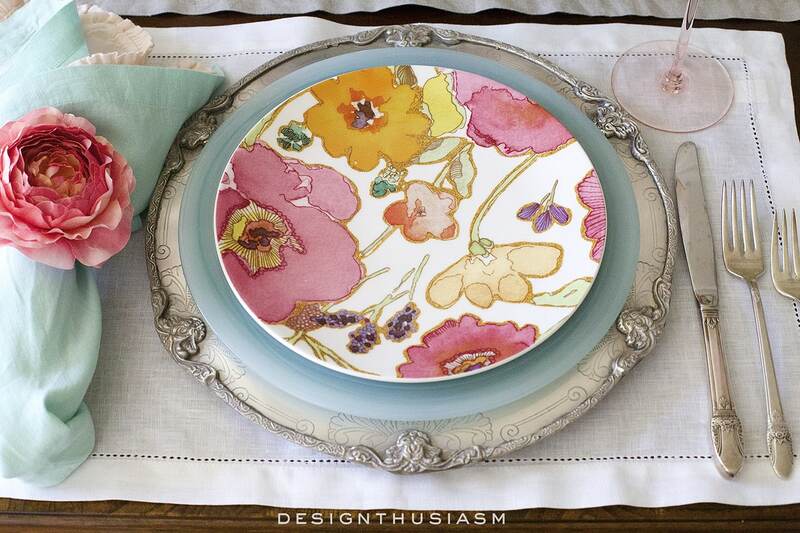 The colors of your table are dreamy! No wonder you were inspired by the plates. And where did you find those gorgeous napkin rings. They are amazing on your table! You knocked this table out-of-the-park! 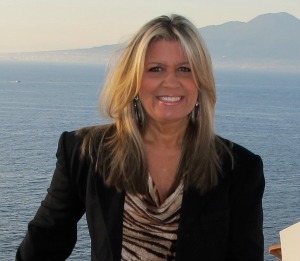 Thanks so much, Yvonne! I struggle with the lighting in my dining room so I’m so glad the colors are resonating… 🙂 The napkin rings are from Pier 1. I’m actually going back in this morning to add the resources – that’s what happens when you write your post at 2am… lol. Pinned this beautiful table right away. It is indeed lovely. 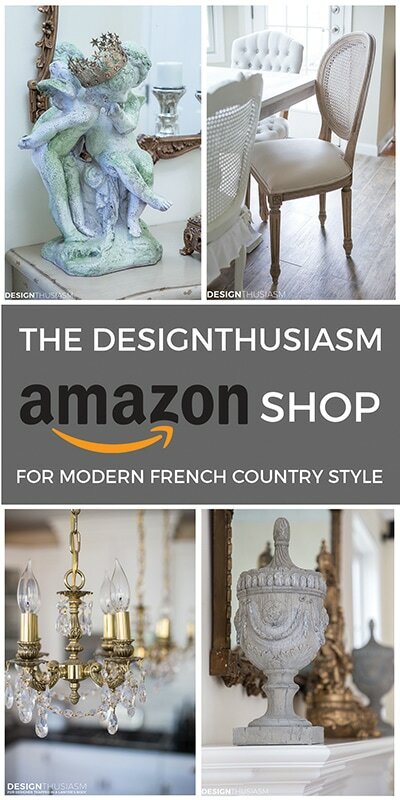 You have such a design gift. I enjoy your instagram so much too. Oh thank you, Bonnie! I’m glad you’re enjoying the Instagram too, because I’m starting to post some one-off photos there that don’t make it to complete blog posts… 🙂 Thanks for stopping by!! Wow is that ever pretty! The beautiful plate was a stunning starting point and I loved seeing my chargers and darling little pagodas in such lovely company:) Beautiful Lory! Thanks, Tina! 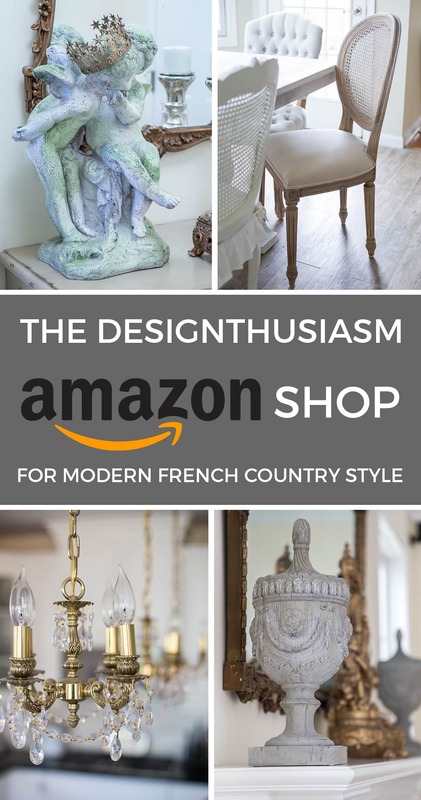 Yes, I’ve actually been meaning to order more of those chargers but there’s always something new I want more… 😉 You definitely have my favorite online shop!! omg, Lory! I LOVE everything about this table! The colors, the flowers, the plates. Gorgeous! This might be my favorite table of yours Lory, gorgeous! Wow, thanks so much, Jenna! Oh my Lory! Your table is stunning! Every little detail was so well thought out. It is absolutely gorgeous. I really love the flowers you used! Did they all come from your garden? I can never put that many decorative items on the table and still have room to put the serving dishes on the table. Thanks, Judith! No, the flowers are from the market, although it would be so much more practical to have a cutting garden… 🙂 I rarely put serving dishes on the table. For large gatherings I like to serve buffet style with serving dishes either on the sideboard or more frequently, on the island in the kitchen. For smaller groups I would plate the meal and serve that way. You have captured the softer side of summer and it feels great! 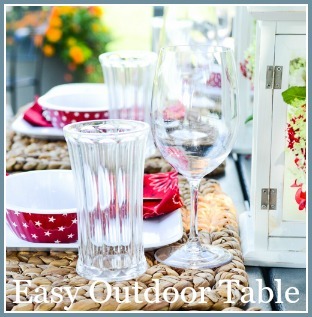 Lori, your tablescape is gorgeous! 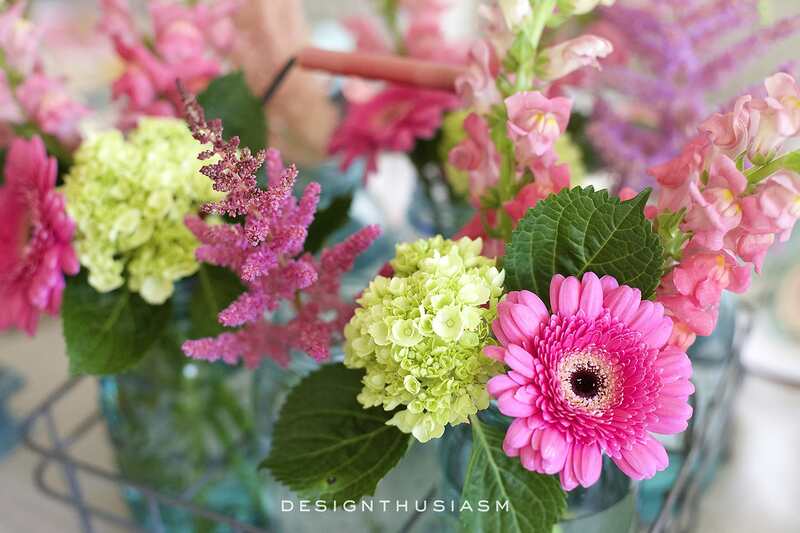 Aqua and blush pink–with the brighter pinks in the astilbe and other flowers–is simply captivating!! Elegant, but fresh and contemporary too. One of my favorite tablescapes ever! 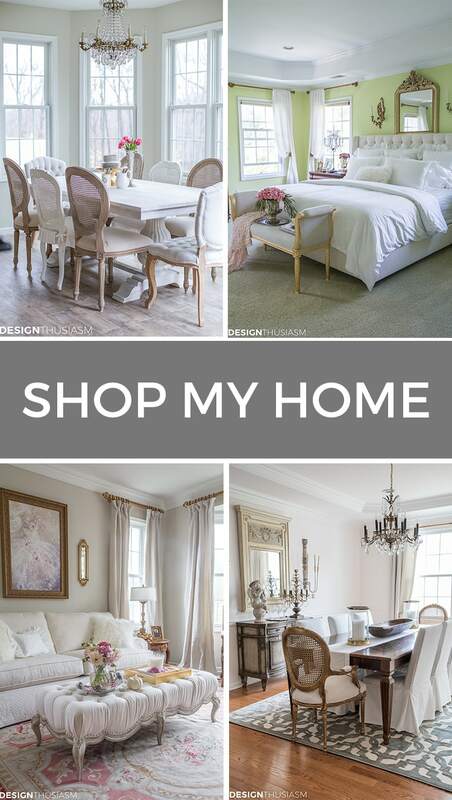 Hope to interpret your design with items I have, but thank you for sharing your source list. Unfortunately, the alabaster dinner plates are no longer available. Thanks, Lori. I did check the store close to my house; they just had the salad plates. But I’ll keep checking. And I did see the Vietri as well! Or, I may use my mother-in-law’s china she gave me–it’s Royal Doulton Melrose–which has a turquoise rim. It would look quite elegant as well. 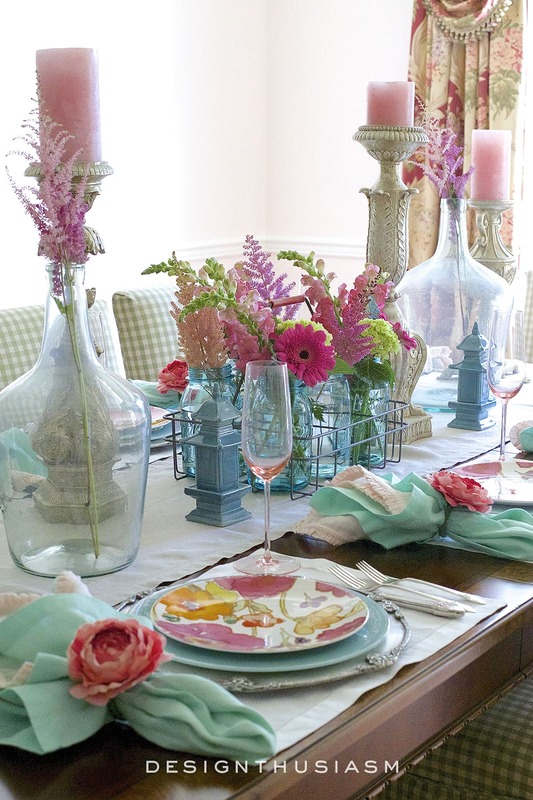 I’m planning a ladies’ luncheon and your beautiful tablescape has given me wonderful inspiration. Thanks again. Just gorgeous, Lory! 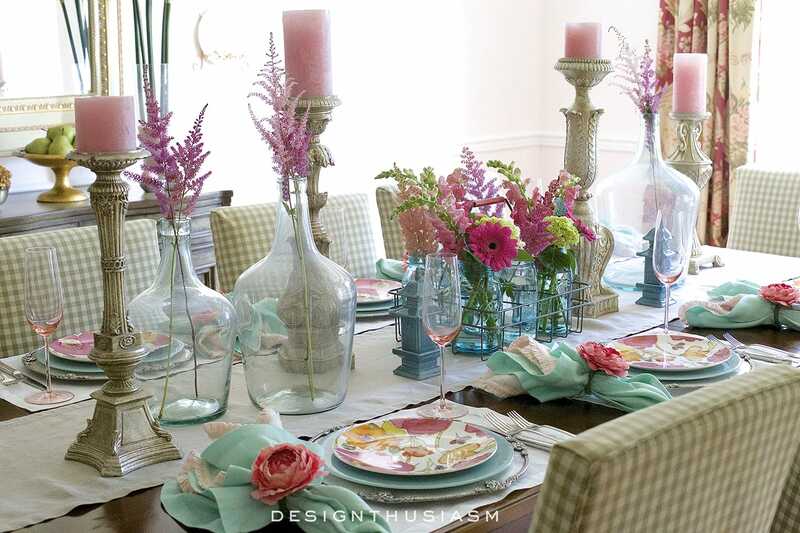 I love pink and aqua together and the fresh flowers are breathtaking! Lory, this table is magical! I love the colors and all the elements you used. 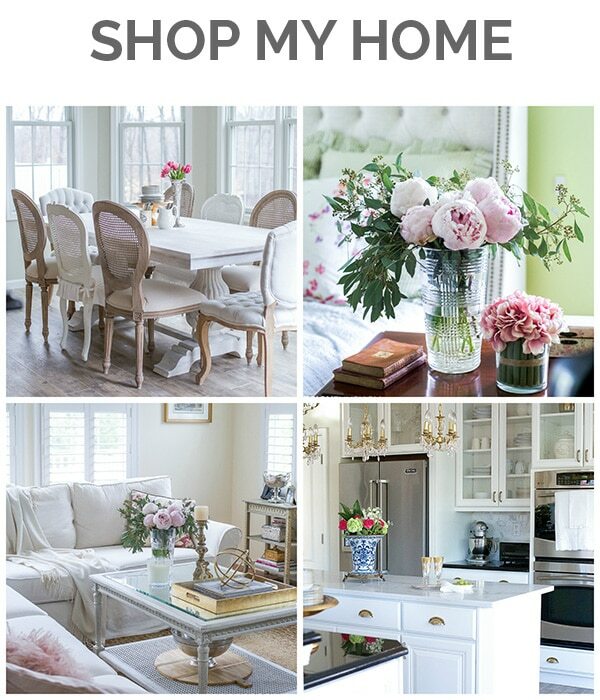 And I want to thank you so for sharing where you purchased many of the items you include in your tablescapes. 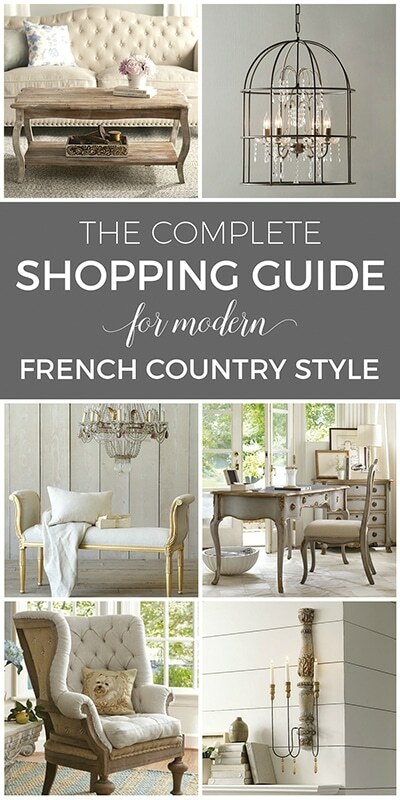 In doing this, you introduce us to new sources for finding lovely items. You have such a talent for combining unexpected colors and have quite an eye for beauty. Thanks so much for these lovely posts. I’d call this summer perfection! 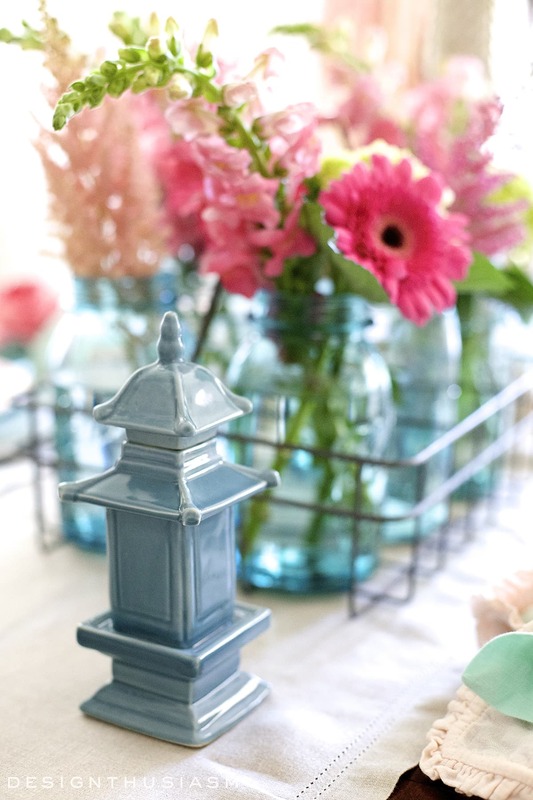 Love the floral centerpieces- such a great pop of color and I like how the aqua napkins and the dinner plates work with the color of the antique mason jars. Lovely combination of elements! Are there two prettier colors together than pink and aqua? I don’t think so! Beautiful tablescape. Your table is so beautiful and summery. 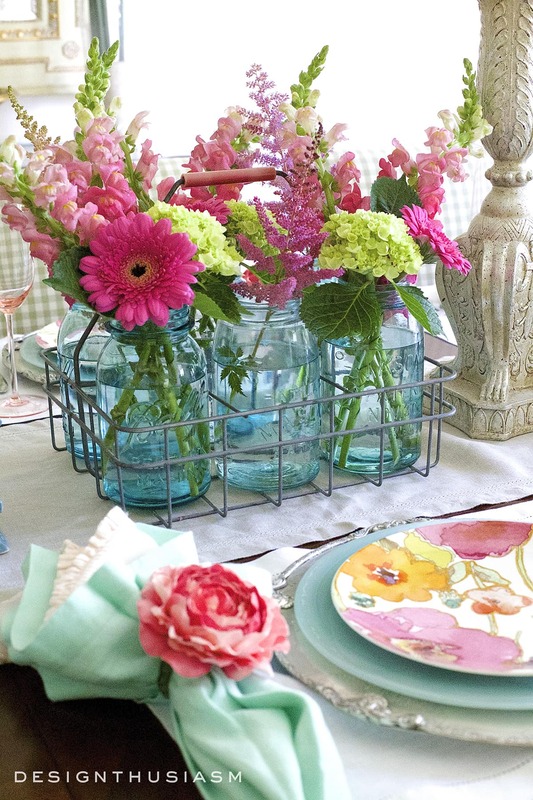 I especially love the colorful flowers in the blue mason jars and the flower napkin rings. Hello – Enjoyed this tablescape. Is there a way to get the “It’s all Set” Series to come to our inbox/email each month? I would love that! And where did you find those dishes? Thanks! Hi Mitzi! Thanks so much!! Yes, if you subscribe to my blog, you’ll get all of my posts to your inbox. If you prefer just to open the ‘It’s All Set’ ones, that’s fine, but I sometimes do other tablescapes, as well, so you can open the ones you’re interested in. 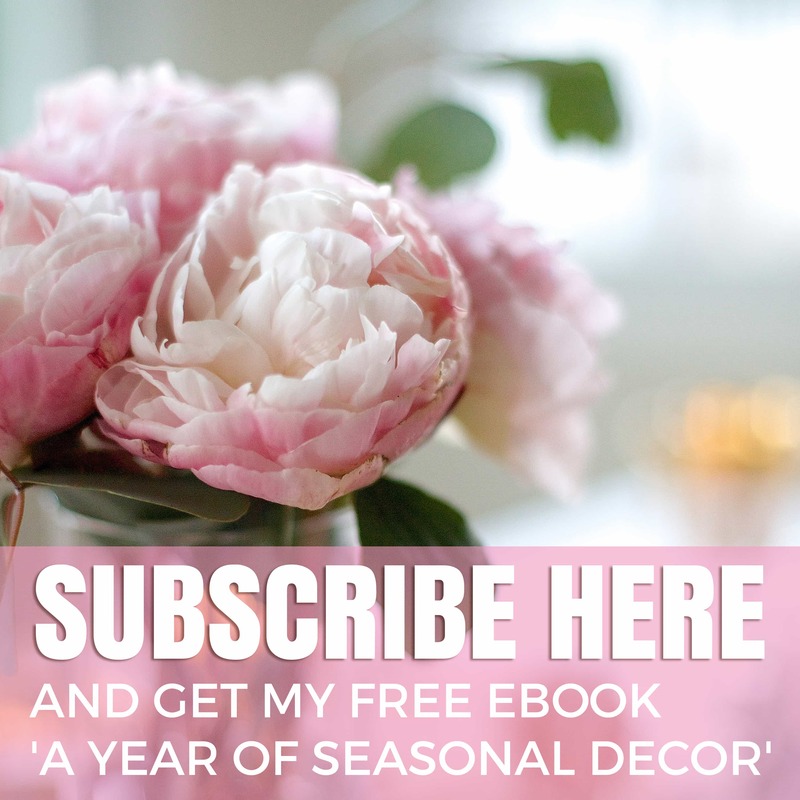 You’ll also get my free E-Book, “A Year of Seasonal Decor” with your subscription… 🙂 There are several subscription boxes on my home page and any of them will work. I got the floral dishes at Macy’s, but I’m not sure they’re available there anymore, so I linked to where you can get them now in the post. Just click on the link at the bottom under source list where it says Floral salad plates and it will take you there. Thanks so much for your interest! Oh, thanks so much, Hilary! And I’m so glad you were able to get them… 🙂 I actually have them in two color ways – the washed silver and the bronzer color. I move them around a lot. You’ll enjoy them!! Oh my, what a dreamy tablescape. Those plates are absolutely amazing! 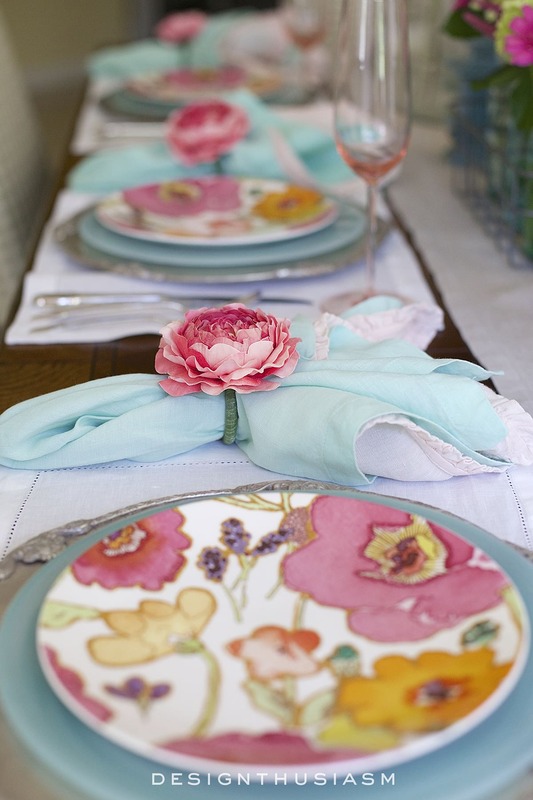 I have the same napkin rings, they are so much fun to use and add such a nice pop of color to a table! 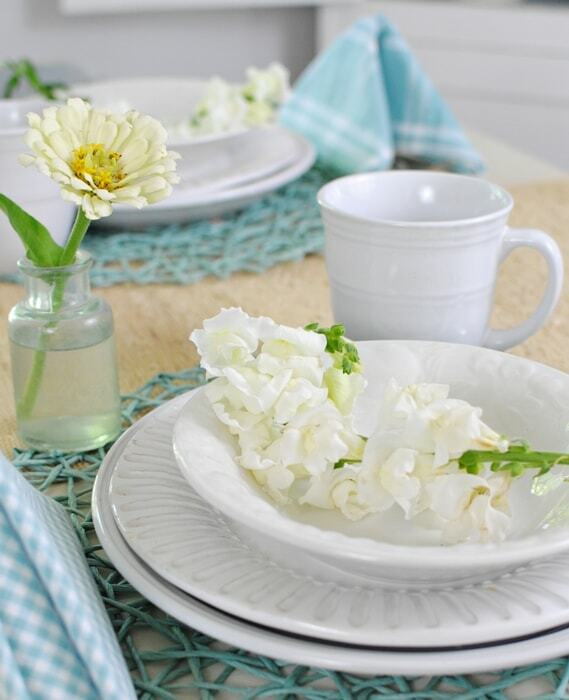 The flowers you chose are the perfect partner with those dishes! I enjoyed revisiting this tablescape. The floral centerpiece was fantastic and of course the dishes too! So pretty! Where did you get the mason jar holder? I love it!